The ideal weight for this dog is 9.5kg and up to 40cm tall for the female, while the male should be about 12kg and 43cm tall. Elegant, graceful and extremely versatile, the Basenji is fastidiously clean, easily house trained and completely lacks any doggy smells. Although the breed's lack of bark is often thought to mean lack of voice, this is definitely not so. In fact, the Basenji has an amazing vocabulary of sounds, and is usually uttered when the dog is happy, or caught in the act of being mischievous. The most common vocalisation is a mixture between a chortle and a yodel. As a watchdog, the Basenji is more positive in its approach than the usual barking house pet - it will raise its hackles and let out an unnerving rumble at the sound of impending danger. It is particularly protective with children. In fact, the breed is said to have the gameness of a Bull mastiff, but with the gentleness of a Labrador. The breed can be disobedient if not trained correctly. It is, however, too intelligent to be forced, so do not try to break your dogs will. You must be firm but fair. But any dog-lover with the patience and tolerance to really understand the Basenji will be rewarded with an affectionate, lovable family companion that thrives on attention. These dogs are natural hunters, with the ability to make the best use of sight, scent and sound. 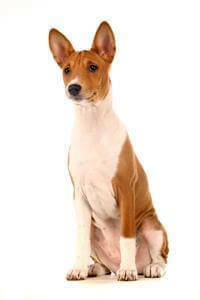 However, these strongly developed hunting instincts can also be the Basenji’s undoing. For instance, if a dog is busy following a scent but a car happens to get in the way, the dog will not see it - this has resulted in an alarming number of Basenjis being killed. For this reason, it is extremely important to have good fencing.